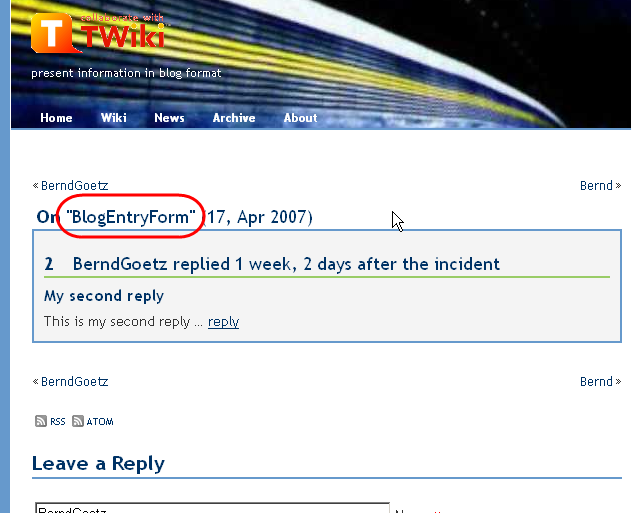 A single blog comment always shows "!BlogEntryForm" as its parent entry instead of either the topic name of the initial blog entry or the title of that initial blog entry. Please refer to the attached screenshot. I'm not sure whether this is the correct approach, though. Did it work out of the box for others? I've got no problems with it. I have a BlogEntry that has one comment, but it doesn't have the behaviour as yours. I've done quite a thorough test before as well on nested comments and such, but can't remember having the same behaviour. Does it happen only when you have 2 un-nested comments?